Pasta 101 or the art of preparing pasta. It comes down to just a few simple elements. And getting them exactly right. It’s not hard. Even if you only have one pan you can still make a plethora of incredible pasta or spaghetti dishes. Just boil spaghetti or cook your pasta properly. In this article or recipe if you will, we help you learn how to boil spaghetti to absolute perfection! The proper way to boil spaghetti is of course AL DENTE. That’s firm and just slightly crunchy. Yes, slightly crunchy. Pasta’s incredible nutty flavor can only be achieved if it is cooked extra firm. I know, I know, this might be foreign to most people. But once you’ve tasted pasta which is truly AL DENTE you’ll understand why Italians adore pasta. So, the essential thing is boiling water. Specifically, well salted boiling water. How much water depends on how much pasta or spaghetti you’re cooking. Plenty of water is best, but, even if you’re limited to a small pan, don’t fret. You’ll learn how to boil spaghetti even in a small pan with salted boiling water. In a perfect world a large, oversized pot would be best. But, if you’re cooking, let’s say, a pound of pasta for a group to enjoy, even an eight cup/two quart pan will do just fine. 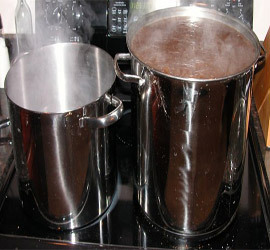 Yes, eight cups or two quarts of water will do the trick to boil spaghetti up to one pound. Bring the water to the highest boil you can. Then leave it at that temperature. Add enough salt (I recommend sea salt for both flavor and mineral content). Just enough so that you can just taste it in the water. Too much salt is as bad as too little salt. Part of learning how to boil spaghetti is learning how much salt works best. Once the water is boiling fiercely add the pasta and stir it briskly in the pan until it comes to a boil once again. Here’s an old professional pasta cooking trick for when you’re cooking any type of spaghetti or long pasta. BREAK THE PASTA IN HALF before dropping it into the pan. Not only will it fit perfectly into just about any sized pot but it will cook evenly. You’re not waiting for the pasta to cook and bend itself into the pan. That can take over a minute. Your pasta will have the same perfect AL DENTE (firm, slightly hard, slightly crunchy) texture all the way through. In addition, it is MUCH EASIER to eat. It also takes on sauces much better than foot long plus pasta. Try it and write me to tell me how much better your pasta tastes. Most pasta packages recommend that you boil spaghetti for a certain number of minutes. In almost every case, if it’s written in English, you will be told to boil spaghetti way beyond it’s AL DENTE phase. Why? Because most Americans are used to pre-cooked pasta at restaurants. It’s prepared hours in advance (gag!) and placed in a refrigerator to be reheated with your chosen sauce when you order. Or, they are accustomed to (Oh my God, no) canned pasta products. So, use the cooking time as a very rough guide. But the key to perfect pasta is to drain it the minute it begins to fold easily. It MUST have a bit of crunchiness to it. The only way you can boil spaghetti to perfection is to keep an eye on it. Stir it regularly as it boils and test it with a fork or spoon. Remember, once you drain it the pasta will keep cooking on its own. By the time you add it to your sauce or accompaniment, over a moderate heat in a pan, it continues to cook as well. This technique is called “in padella” . Meaning “in the pan,” in Italian. Thick macaroni products (ziti, farfalle, rotini) will take slightly longer to cook than spaghetti varieties. The thinner the spaghetti variety, the LESS time it will take to boil spaghetti al dente. Angel hair pasta can take less than two minutes to cook if you’re going to finish it properly. Meaning “in padella” where it will continue to cook or soften. And NEVER, EVER, EVER rinse pasta. You will destroy its flavor, make it soft, and destroy the ultimate pasta experience. So remember, NEVER, EVER, EVER rinse pasta. Another excellent professional pasta cooking tip is to save a cup or so of the cooking water before draining. Then, later add it to your to your sauce or accompaniment if that needs more moisture. Adding fresh water will destroy the pasta’s flavor as if you’ve rinsed it. So, just in case, keep a cup of the cooking water handy. If this sounds like a more complicated process than you’re used to, relax. I assure you it becomes second nature after you’ve tried the technique just a few times. More about “in padella” in another post. Meanwhile, happy trails learning (always, by doing) how to boil spaghetti. Guide to Italian Food) to task on several supposedly “authentic” Italian recipes. Wow, I have been cooking pasta for years and never knew about the no rinsing part. I’m not a very good cook, but do love to experience with various pasta dishes. Thanks for the tip. Excellent presentation. This lady has put her heart in this ! Risotto – Better Prepared In The U.S.
Lasagne Verdi alla Bolognese – best recipe! Basil & Basil – in Pesto Sauce & Italian Cooking ! Is Pasta Healthy for You ? Carmelita Caruana on Risotto – Better Prepared In The U.S.